During these final weeks of the liturgical year, the Church calls us to consider the truths about Faith which speak of eternal life. These are obviously of immediate relevance to our lives. We hear in the Second Reading of Mass this Sunday that the Lord will arrive like a thief in the night. No matter how prepared we think we are for His arrival, death will always take us by surprise. 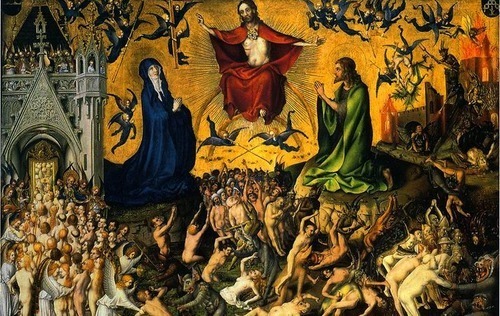 In the Gospel of Mass our Lord teaches us that we must spend our earthly life in such a way as to win Heaven; it is an interesting analogy that He uses, comparing our time on earth as a long-term leasing arrangement. The end of life is nothing more than a change of tempo, a continuum from what began at the mention of our conception. We might view death as something like when a tapestry has been completed. We have watched the tapestry being made from the reverse side where the design of the artwork is blurred and the knots and twisted loops of the needlework are prominent. Our Father God always views the tapestry from the good side. He is pleased to behold a finished work that manifests a life-long effort to make good use of the time and talents that He has given us. Next Sunday - Feast of Christ the King - we celebrate each year the Universal sovereignty of Jesus Christ. It is also designated as National Youth Sunday and some of our young people will speak at the end of the Masses about ways in which we can support youth work in our Parish and Deanery. This is followed by the final three days of the liturgical year which are the days in our Parish each year of Eucharistic Adoration or the Forty Hours’ Prayer. Please sign the lists for Watching which are at the back of church; you may also purchase candles from the Sacristy (five pounds) which will be burned before the Altar for your special intentions, and then used throughout the coming year as the Sanctuary lamp that burns before the Tabernacle. God bless you.